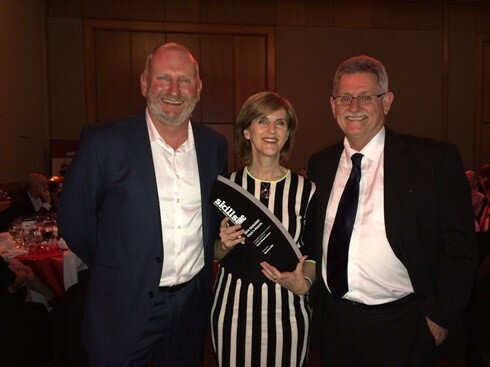 PM-Partners group in cooperation with Downer Infrastructure recently claimed the prestigious Skills DMC 2014 Chairman’s Award, recognising outstanding commitment and leadership in workforce planning and development. PM-Partners created ‘Project Plus’, a customised project management program designed wholly for Downer Infrastructure. David Cattell, CEO of Downer Infrastructure described the program as a “fantastic achievement… which recognises the work and effort that has been invested over the past 18 months to bring world class project management capabilities to our company”. The program which was developed in line with industry standards and aligned to both the Downer Project Management Methodology and the Certificate IV requirements by ASQA has been designed to equip project management practitioners with the critical skills and knowledge to deliver successful project results for Downer and its customers across Australia and New Zealand. Since it was introduced in late 2013, more than 370 people have commenced the program with over 1000 more to start in 2015. Bernadette Cavanagh, General Manager of Workforce Capability at Downer commented on our involvement in the program, “…this recognition by industry is representative of a lot of hard work from many people, not least of which are each of you. The work and passion you put in to getting this program off the ground has made a huge difference to the results. It is wonderful to have each one of you involved. PM-Partners group is a great partner in this initiative and has helped us make a massive difference to the capability of our project workforce. We love hearing the stories of individual impact and are heartened by the results we are achieving“. The introduction of the program at Downer will mean a significant increase in capability uplift which in turn will mean that the Project Managers and Project staff are equipped with the tools and techniques needed for the successful delivery of multi-million dollar projects. With successful delivery come successful outcomes which in turn mean that projects have far more chance of turning a healthy profit for Downer Infrastructure. Mike Boutel, Head of Capability at PM-Partners added that “the Project Plus program sums up our dedication and commitment to our customers. The ability we have to not only design and build a world-class program, but also to know that the course is being delivered by the best facilitators in Australia and New Zealand. The pure dedication of these guys to understand the background and constraints within Downer and to be confident to deliver a Project Management course, aligned to ASQA Certificate IV requirements is beyond most organisations capability. We have not only proved we can perform, but we can go beyond expectations”. This fantastic success could not have happened without the hard work of the PM-Partners and Downer teams. Thank you to everyone involved and in particular the below for your outstanding commitment to the program.